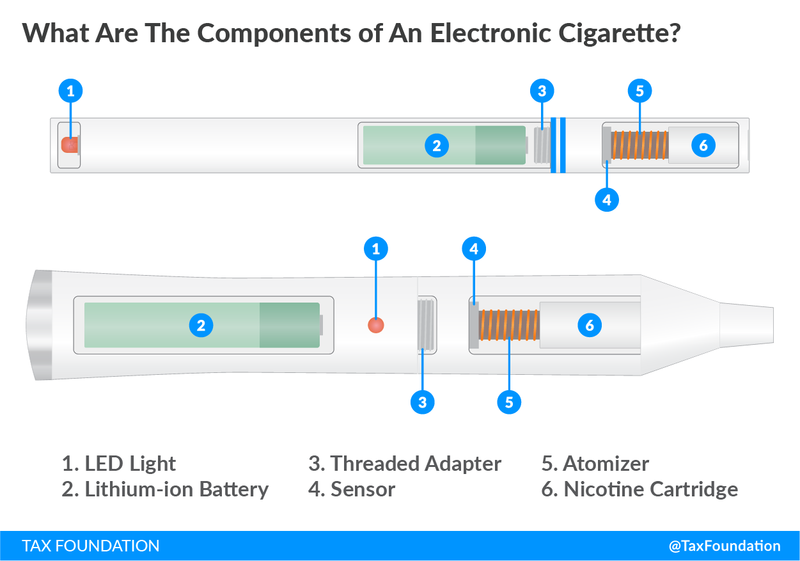 Vapor products, also known as electronic cigarettes, have become a common sight at gas stations, convenience stores, and stand-alone vapor shops since their market debut in 2007. Their desirability to customers is based on their ability to deliver nicotine without combustion and inhalation of tar. 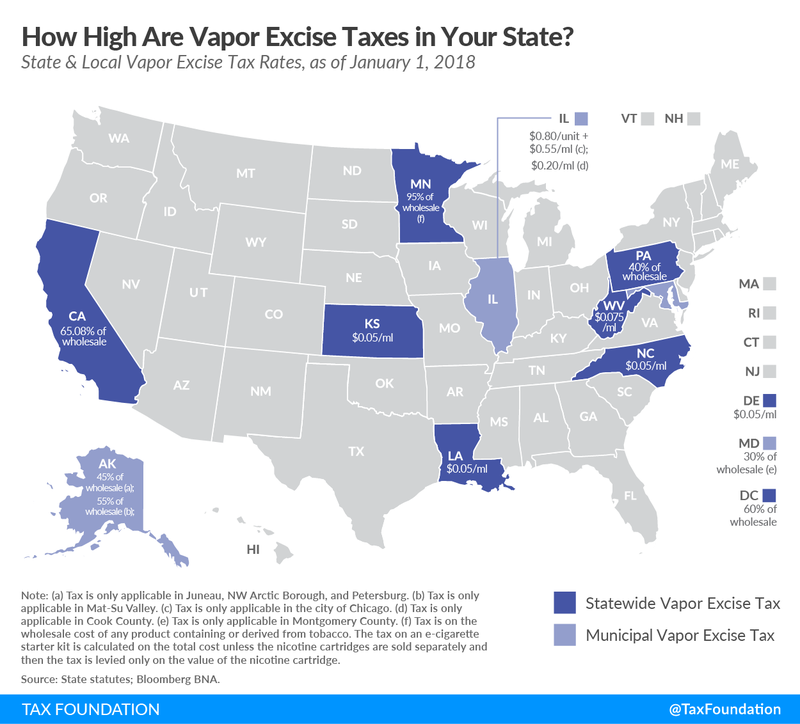 There is currently no federal excise tax on vapor products, but some states and localities have enacted their own vapor taxes at varying rates. Eight states and the District of Columbia levy a statewide excise tax on vapor, and three states are home to localities that have started to apply excise taxes to the products. This week’s map shows where state and local vapor taxes stand as of January 1, 2018. Taxation methods of vapor products vary across states and localities. Some tax a percentage of the wholesale value while others tax per unit or milliliter of e-liquid. One notable advantage to taxing the products based on volume (per milliliter) as opposed to based on price (ad valorem) is that volume taxes do not apply to the delivery device when the e-liquid and electronic device are sold together. As an allegory, this would be like taxing a pipe, when an excise tax really only should apply to the pipe tobacco. Of the states that tax the wholesale value, Minnesota is the highest by far (95 percent), followed by California (65.08 percent). Chicago levies the highest per unit tax ($0.80) plus a per milliliter rate ($0.55). Louisiana and North Carolina have the lowest per milliliter rate ($0.05). There is a broader conversation about the relative risk of vapor products compared to traditional cigarettes. Recent research from Public Health England shows that vaping is 95 percent less harmful compared to smoking cigarettes. Advocates of lower or no taxes on vapor products argue that high taxes could discourage current cigarette smokers from using vapor as a tool for quitting traditional cigarettes. Proponents of higher taxes assert that the health risks of vapor usage are unknown and any chance of young people picking up the habit is not worth the risk. Read our comprehensive study “Vapor Products and Tax Policy” here. The legalization of marijuana is becoming a reality in many states, and with that exists rare opportunities for state and local governments to experiment with new structural approaches to taxation. One such natural experiment occurred in Washington State in June of 2015, when lawmakers during a special session of the Washington Legislature changed a 25 percent gross receipts tax that applied to the marijuana industry to a 37 percent excise tax assessed on the retail price of marijuana sold. A recent National Bureau of Economic Research study by Benjamin Hansen, Keaton Miller, and Caroline Weber analyzed the shift in policy and found that the gross receipts tax caused significant distortionary effects on the industry and directly encouraged inefficient vertical integration among firms. The new empirical evidence highlights the distortionary effects of gross receipts taxes and bodes bad news for Washington State’s existing, unrelated gross receipts tax, the Business & Occupation tax, and for other states currently imposing or considering gross receipts taxes. Before the reform, Washington had essentially split the cannabis industry into three sectors: cultivators, processors, and retailers. The state levied a 25 percent gross receipts tax on transactions among the three sectors of the marijuana industry and at retail. This meant that a 25 percent tax was applied when cultivators sold their freshly harvested product to processors, when processors sold the finished goods to retailers, and when retailers sold the finished goods to customers. Despite Washington banning vertical integration between retailers and other types of firms (only two of the three sectors), the old tax regime heavily encouraged vertical integration between cultivators and processors. This allowed firms that specialized at both cultivating and processing marijuana to avoid one layer of taxation entirely. After the reform, Washington replaced its somewhat convoluted system with a simple 37 percent sales tax applied solely at the retail level. Being a much less distortionary policy, this allowed firms to organize in whichever way they thought was most efficient given their specializations. Given Washington’s “seed-to-sale” tracking system, Hansen et al. were able to empirically estimate the effects of switching from a gross receipts tax to a traditional retail excise tax with much more data than would have otherwise been available. The authors noticed that ending the gross receipts tax led to a statistically significant decrease in vertical integration. They found that, after an adjustment period, the fraction of vertically integrated marijuana sales in Washington fell by 3.7 percent, which was driven by a 42 percent long-run increase in non-vertically produced marijuana sold. In other words, with the layer of tax between cultivators and processors gone, some businesses found it more profitable to specialize in only one aspect of production. This shows that gross receipts taxes discourage otherwise efficient trades between firms, leading to a relatively large deadweight loss when compared to traditional retail sales taxes. The authors also measured the price elasticity of the marijuana market, a wonkish term used to describe a market’s sensitivity to changes in price. They measured the amount of marijuana sold in the days surrounding the price increase and found that customers were mostly unresponsive to the increased cost in the short-run. However, the authors noted a reduction in the quantity of marijuana sold in the medium-run when compared to its previous trend, which could indicate that marijuana still faces significant competition from black market sales. Raising taxes on the product any further might price individuals out of the legal market altogether. Consequently, this also implies that when compared to Washington’s 37 percent sales tax, “considerable state revenue may be left on the table” by other states that have considerably lower excise tax rates ranging between 3.75 and 15 percent. The study also warns against other potentially distortionary taxes in the marijuana industry, such as cultivation taxes. Cultivation taxes directly tax the weight of cultivated marijuana, which has unintended consequences such as discouraging the production of less potent, cheaper marijuana. For example, a pound of relatively cheap marijuana would have the same tax burden as a pound of high-quality, expensive marijuana because cultivation taxes depend on the product’s weight and not its value. Currently three states, Alaska, California, and Colorado, have cultivation taxes, which may be encouraging suppliers to produce higher quality marijuana than customers would prefer. Cultivation taxes effectively price out firms which may have been able to specialize in the production of less potent marijuana, which could potentially be a health concern to marijuana users. States that consider marijuana legalization have the unique opportunity to observe natural experiments occurring all over the country in other states. It is crucial that lawmakers utilize proven and principled tax policy when tackling this new and booming industry. The $1.3 trillion spending bill passed by Congress includes IRS funding and tax-related technical corrections, including changes to the centralized partnership audit regime. In 2015, OECD countries relied heavily on consumption taxes, such as the value-added tax, and social insurance taxes, such as the payroll tax. The United States relied heavily on the individual income tax, at 40.5 percent of total government tax revenue. On average, OECD countries collected little from the corporate income tax (8.9 percent of total tax revenue). Developed countries raise tax revenue through a mix of individual income taxes, corporate income taxes, social insurance taxes, taxes on goods and services, and property taxes. However, the extent to which an individual country relies on any of these taxes can differ substantially. A country may decide to have a lower corporate income tax to attract investment, which may reduce its reliance on the corporate income tax revenue and increase its reliance on other taxes, such as social insurance taxes or consumption taxes. For example, in 2015, Estonia raised only 6.2 percent of total revenue from corporate income taxes but made it up by raising a combined 75.2 percent of total revenue from social insurance taxes and consumption taxes. These policy and economic differences among Organisation for Economic Co-operation and Development (OECD) countries have created differences in how they raise tax revenue. Per the most recent data from the OECD (2015), consumption taxes were the largest source of tax revenue for OECD countries. On average, countries raised approximately 32.4 percent of their tax revenue from consumption taxes. This is unsurprising given that all OECD countries (except the United States) levy value-added taxes at relatively high rates. The next significant source of tax revenue is social insurance taxes. OECD countries raised approximately 25.8 percent of total revenue from social insurance taxes. Individual income taxes accounted for 24.4 percent of total revenue across the OECD. Corporate income taxes accounted for only 8.9 percent of total revenue. Of the main categories, property taxes raised the least across the OECD, accounting for only 5.8 percent of total revenue. 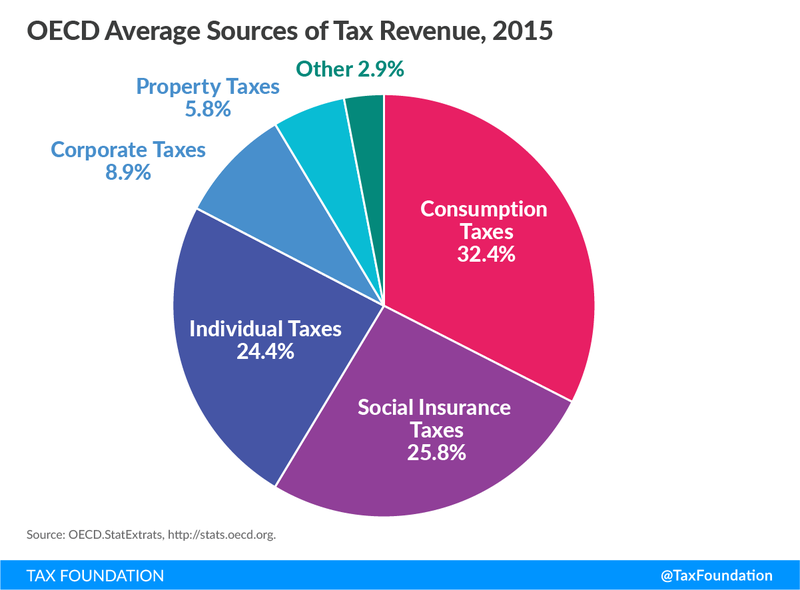 In 2015, the United States relied the most on individual income taxes. 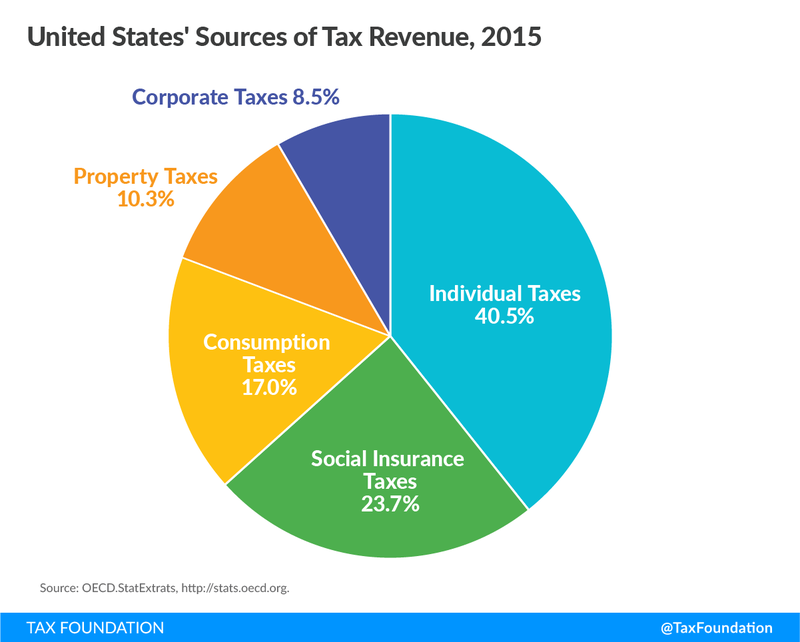 According to OECD data, the United States (federal, state, and local combined) raised approximately 40.5 percent of all tax revenue from individual income taxes (compared to the 24.4 percent among all OECD countries). Social insurance taxes made up the second largest source of government revenue in the United States (23.7 percent compared to the OECD average of 25.8 percent). The United States relied much less on taxes on goods and services than other OECD countries. In 2015, the United States raised 17.0 percent of its total tax revenue from taxes on goods and services (consumption taxes), compared to 32.4 percent among OECD countries. The smallest source of tax revenue for the United States was the corporate income tax. Federal, state, and local governments in the United States collected 8.5 percent of their total tax revenue from corporate income taxes in 2015, compared to the OECD average of 8.9 percent. Consumption taxes are taxes on goods and services. These are in the form of excise taxes, value-added taxes, or retail sales taxes. Most OECD countries levy consumption taxes through value-added taxes and excise taxes. The United States is the only country in the OECD with no value-added tax. Instead, most state governments apply a retail sales tax on the final sale of products and excise taxes on the production of goods such as cigarettes and alcohol. The United States raised the least amount of tax revenue in the OECD from consumption taxes, as a share of total revenue, at 17.0 percent in 2015. Japan raised slightly more, at 21.0 percent, followed by Switzerland, at 21.8 percent. Social insurance taxes are typically levied in order to fund specific programs such as unemployment insurance, health insurance, and old age insurance. In most countries, these taxes are applied to both an individual’s wages and an employer’s payroll. For example, the United States levies social insurance taxes at both the state and federal level in order to fund programs such as Social Security, Medicare, and Unemployment Insurance. Denmark raised the least, at 0.1 percent. Australia and New Zealand are the only countries that do not levy specific social insurance taxes on workers to fund government programs. Income taxes are levied directly on an individual’s income, beginning with wage income. Many nations, such as the United States, also levy their individual income tax on investment income such as capital gains, dividends, interest, and business income. These taxes are typically levied in a progressive manner, meaning that an individual’s average tax rate increases as income increases. The Slovak Republic (9.7 percent) and Chile (9.8 percent) raised the least amount of revenue from individual income taxes. In 2015, Slovenia (4.0 percent), Hungary (4.6 percent), and France (4.6 percent) relied the least on the corporate income tax. Estonia relied the least on property taxes, raising only 0.8 percent of total revenue. The Slovak Republic (1.3 percent), Austria (1.3 percent), and the Czech Republic (1.4 percent) also relied very little on property taxes. In general, developed nations lean more on tax revenue from social insurance taxes and consumption taxes. 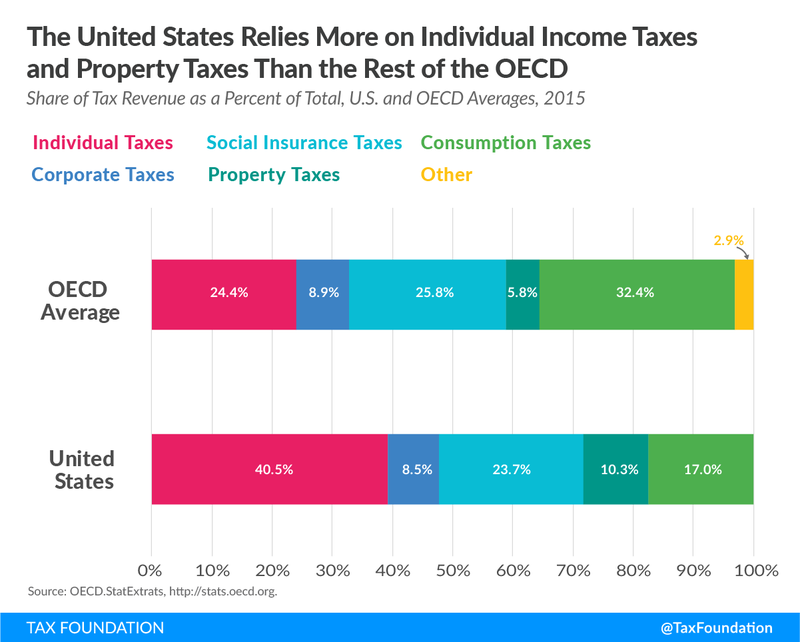 The United States, in contrast, relies more on individual income taxes, while raising relatively little from consumption taxes. This policy difference matters, considering that consumption-based taxes raise revenue with less economic damage and distortionary effects than taxes on income. How High are Spirits Taxes in Your State? Tax Policy – How High are Spirits Taxes in Your State? Compared to taxes on alcoholic beverages such as wine and beer, distilled spirits are taxed at much higher rates across the states, ostensibly to adjust for higher alcohol content. Today’s map shows how spirits excise taxes in your state compare. Data for this map comes from the Distilled Spirits Council of the United States. To allow for comparability across states, they use a methodology that calculates implied excise tax rates in those states with government monopoly sales. Washington state has the highest spirits excise tax rate at $32.52 per gallon, followed by Oregon ($22.75), Virginia ($19.93), Alabama ($18.27), and Utah ($15.38). Spirits are taxed the least in Wyoming and New Hampshire, where government-run stores have set prices low enough that they are comparable to having no taxes on spirits. Following Wyoming and New Hampshire are Missouri ($2.00), Colorado ($2.28), Texas ($2.40), and Kansas ($2.50). Like many excise taxes, the treatment of spirits varies widely across the states. Spirits excise rates may include a wholesale tax rate converted to a gallonage excise tax rate; case and/or bottle fees, which can vary based on size of container; retail and distributor license fees, converted into a gallonage excise tax rate; as well as additional sales taxes. (Note that this measure does not include general sales tax, only taxes in excess of the general sales tax rate.) Rates may also differ within states according to alcohol content, place of production, or place purchased (such as on- or off-premise or onboard airlines). 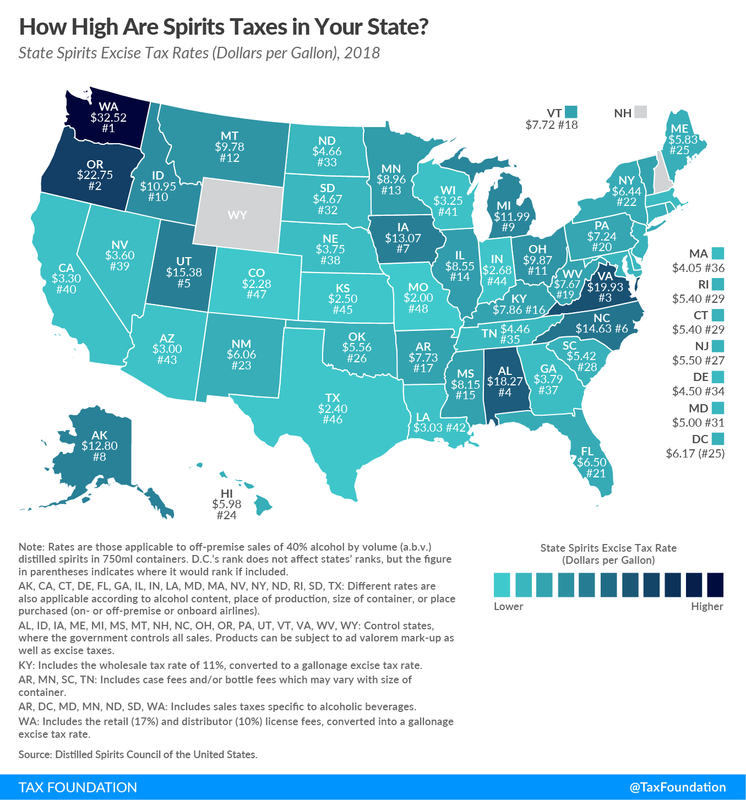 Source: Tax Policy – How High are Spirits Taxes in Your State?